Officially, there are no suspects in the Boston Marathon Bombing. But there is a ton of speculation. Here’s a good lesson. Don’t believe it but don’t ignore it. One of my intelligence sources gave me this advice that also confirms what we’re doing here on Informed Not Inflamed. Read and watch a wide range of media sources. If you read and watch all forms of media, even the extremists or the biased news outlets, a semblance of truth will come out. You will be able to figure it out. Apply this to what happened yesterday in the aftermath of the explosion. The New York Post had stories online yesterday that said a Saudi national was in custody and in the hospital with burns. The implication: a suicide bomber. 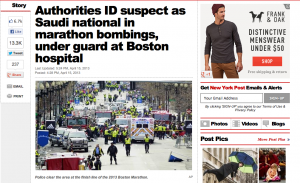 Investigators have a suspect — a Saudi Arabian national — in the horrific Boston Marathon bombings, The Post has learned. Law enforcement sources said the 20-year-old suspect was under guard at an undisclosed Boston hospital. Fox News reported that the suspect suffered severe burns. It was not immediately clear why the man was hospitalized and whether he was injured in the attack or in his apprehension. 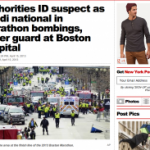 The man was caught less than two hours after the 2:50 p.m. bombing on the finish line of the race, in the heart of Boston. I reposted this on my sites. I specifically cited the New York Post as the source. Not long after, Twitter and Facebook went nuts. Here’s one tweet. Next person to quote NYPost as a reliable source has to donate $100 to the Red Cross. The New York Post is a tabloid newspaper. It’s considered a rag by most journalists. It’s silly and sometimes plays with the truth to make wild headlines to gain readers who are looking for entertainment. The New York Post is owned by News Corp – which also owns Fox News. And Fox News eventually quoted this story on air. I have said here numerous times: I have more problems with Fox News’ tabloid journalism (entertainment bias) than its right-wing slants and distortions. Still, there appears to be something to this story. As of Tuesday morning, the day after, at least one, maybe two Saudi nationals are being interrogated. Tabloids have broken some big stories over the years that eventually became mainstream. When you talk about this aspect of the story, be careful. Quote the New York Post but remind people that is the only publication and it is a publication known for sensationalism. So, ignore nothing. But believe nothing too. Make the facts prove the truth. Don’t try to create a truth out of disparate facts. Question, analyze, then question again.